WHO has not been blocked on the street by people aimlessly drifting while reading their phone? 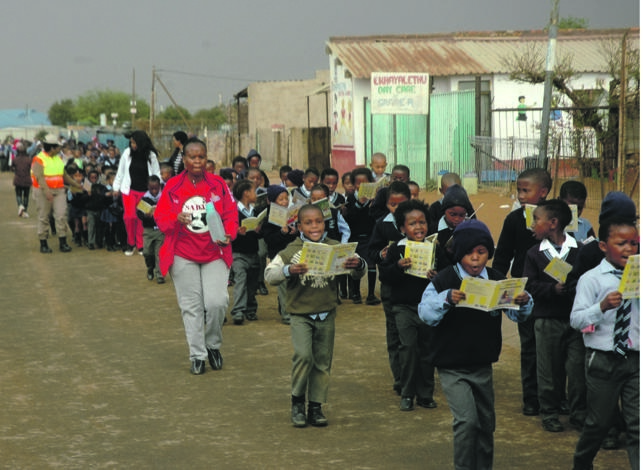 Some pupils have shown Mzansi how they should read and walk. Started by the department of education, the Walk and Read programme is active in all Ekurhuleni primary schools. It is a public exercise to create awareness that children need to understand what they read and write – and hopefully learn to love books too. She said having lots of books at home and at libraries naturally encourages children to read. Mokoena also reminded her class that reading brightens the path to a better future. “We always encourage our pupils to visit school or community libraries to read – especially during school holidays. “Getting a break from school is a great way to enrich your mind with fun and exciting stories. Mokoena said pupils who are members of a library enjoy reading more than anything else. The children of Walk and Read are not aimlessly wandering all over the roads. They are guided by adults who watch for them. It is how the teachers show the children how important it is that they improve their reading skill. While she is proud of the Walk and Read initiative, there are other important school programmes as well. One of them is the spelling bee competition. Organised by public libraries, the spelling bee brings together pupils from different Ekurhuleni primary schools to find out who among them makes the fewest mistakes while spelling the most complex and tricky words. “It is important to learn new words every single day.